Windows 10 declared Internet Explorer as no longer available and came up with Microsoft edge. From my personal experience, Microsoft Edge is a lightweight, super-fast and user-friendly browser. Although it is a system protected browser to defend against malware or other cyber-attacks, unfortunate things happen. If you are experiencing the glitch or inappropriate behavior from your Microsoft Edge browser, then it’s time to reset or repair your browser. Wondering about how to Repair or Reset Microsoft Edge browser? Let’s have a step by step walk-through to do it correctly. However there was no option to reset in initial version of Windows 10. You will not find the reset or repair option in older non-updated version of Windows10. If this is so then first step is to update windows 10 to the latest update. 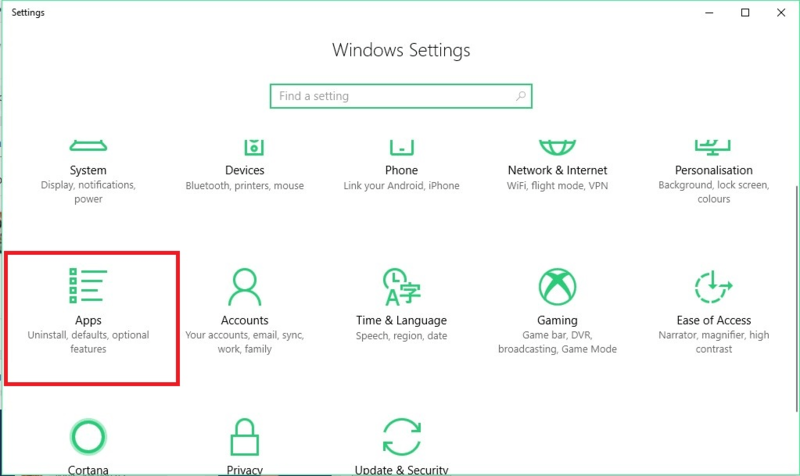 Step 1: Click “Settings” from the Start Menu, and enter to “APPS” from Settings windows. Step 2: Find Microsoft Edge from the “Apps and Features” scrollable sub menu. Step 3: Click “Advance options” and a new tab will appear on the screen. 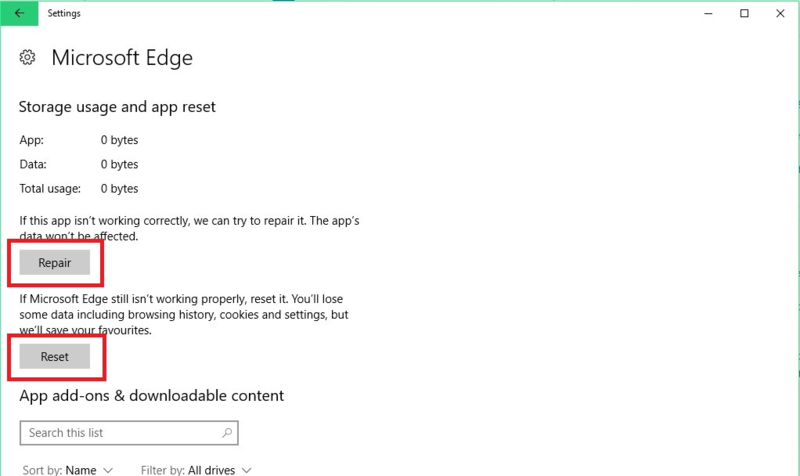 Step 4: Click the Repair option to repair, and Reset option to reset your Microsoft EDGE browser. This process may take a while, windows will automatically Repair or Reset it for you. Caution: Once you click “Reset,” previous browser data and cache will be cleared. If the above process doesn’t work for your Microsoft edge browser and still facing problems while browsing, things might go seriously wrong. But, don’t panic, if “Repair” or “Reset” doesn’t work, there is always another way. Now, what you need is, Uninstall and Reinstall your Microsoft Edge browser. Let me explain, how to do it. It’s not a complex process but things will be a lot easier if you have already experienced uninstalling Windows Store Applications. You can do it via Third Party Application like CCleaner or manually use the windows explorer. Download and install CCleaner from their official website. Don’t worry, it’s a freemium software and safe. Go to Tools ->Uninstall. Here in the side tab, all applications will appear. Find the Microsoft Edge and uninstall it. Open Windows “Store” App, search for “Microsoft Edge” and download it. Store will automatically download and install Microsoft Edge browser. Caution: As I have already stated, Microsoft Edge is a System Protected application, so there is a chance of not finding Microsoft Edge on your CCleaner. It might depend on your CCleaner version, Windows Build version, and app permissions. So if you don’t find it, just follow the “Method: 2”, which is safer than using the third-party application. Step 1: Restart your computer in Safe Mode. If you don’t know how to start Windows 10 in safe mode, see here. 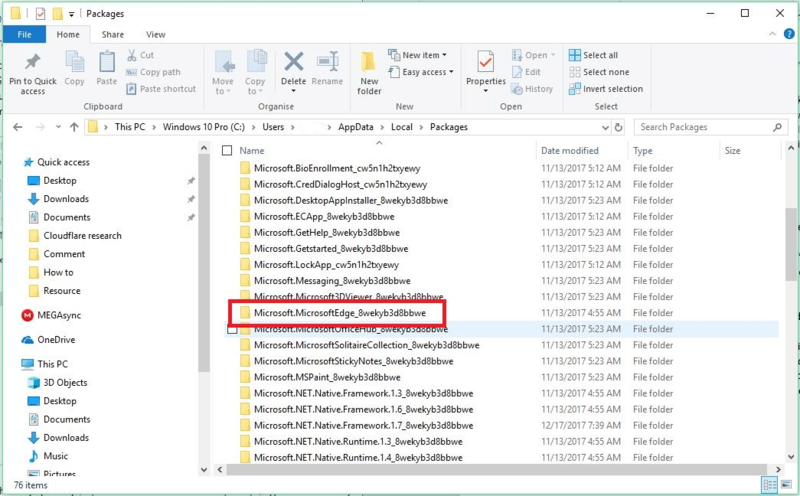 Step 2: Open File Explorer and navigate this location from the explorer menu: C:\Users\%username%\AppData\Local\Packages. Step 3: In the Packages folder, find the Microsoft.MicrosoftEdge_8wekyb3d8bbwe folder and Press SHIFT+DELETE to permanently delete it. Step 4: Now open the Store and search for Microsoft Edge. 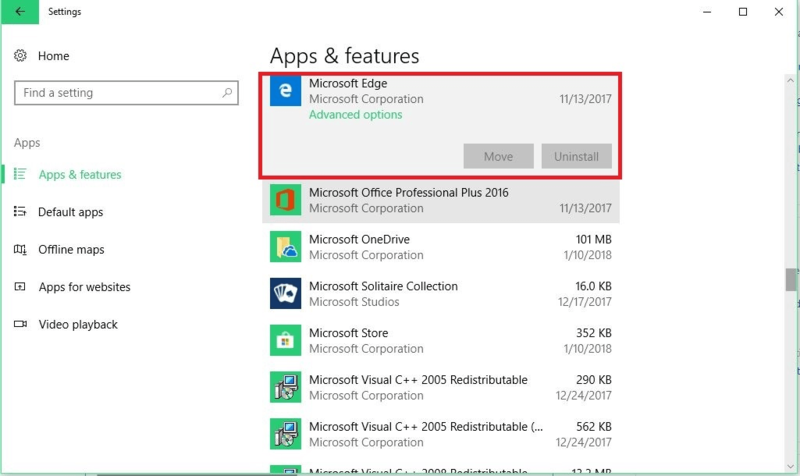 You will see the Microsoft Edge on the search result, click “Download.” Store will automatically download and install Microsoft Edge for you. Please share your experience or ask your question in below comment section. How to Enable, Disable Tab Preview in Microsoft Edge Browser. Windows Spotlight Not Working? Fix it easily.